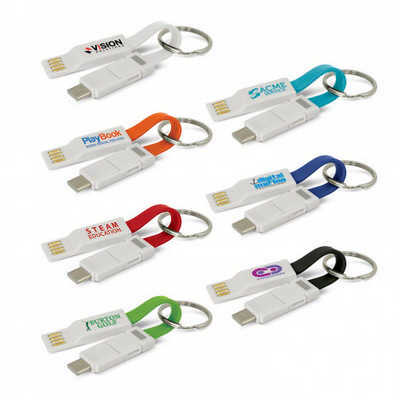 Compact charging cable with a handy key ring which folds over and snaps together with a strong magnetic closure. It has a USB connector on one end and a USB Type-C connector on the other. Simply pull and flip the USB Type-C connector to expose a unique twin connector which has Lightning (for iPhone) on one side and Micro-B USB on the other. Electron is for charging only and is not designed for data connections. Colours: White, Orange, Red, Bright Green, Light Blue, Dark Blue, Black. Dimension: L 130mm x 12mm. Print Description: 20mm x 10mm. Print Type: Pad Print. Packing: Loose packed. Price includes : 1 Col 1 Pos Print. Setup is included.